Fast Food News: Castle's Chicken Rings from holy chicken? Castle's Chicken Rings from holy chicken? When I wrote about White Castle's new flavored chicken rings last month, I ended by asking, "What the heck is a chicken ring?" Now White Castle's PR agency has produced a viral video, with a photo (shown) and a story to go along with it, which attempts a humorous approach to explaining the chicken rings' origin. I think it's good that White Castle has a sense of humor about the obvious questions that arise from serving such a bizarre menu item, and it's much more enjoyable than the self-righteous claims of superiority that some fast food companies (read Arby's) has done about the 'quality' of their chicken. Having said that, this viral campaign is a bit weak. The doctored photo is good, but the video is simplistic; the actor quite annoying. What could have really helped is a dedicated website with the back story, more photos, and other chicken ring related features, like Long John Silver's Shrimp Buddy site, or BK's Coq Roq site to promote their chicken fries. Cincinnati, OH - Buck "Cooter" Jones was driving down State Road 22 Monday morning when he discovered what has been a long standing urban myth. After running out of gas that summer morning, Jones sauntered down Hidden Valley Road in search of a gas station. 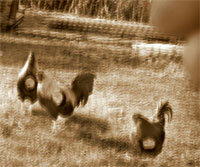 Instead of finding fuel, he stumbled upon farmland, but not just any farm - it was the rumored chicken ring farm. "The chickens, I never seen nothing like 'em," Jones said. "These nuggetless birds were just running around with holes right through their middle." But, seeing the irregular shaped chickens wasn't the weirdest aspect of the discovery; it was the aroma radiating from the farm. "I've been around a lot of chicken farms in my day, and none of 'em got my mouth watering quite like this one," Jones said. "It was a strong, spicy smell, almost like Tabasco Sauce, mixed with a ranch dressing smell, but I don't know where it was coming from. I looked around and it was just me and a bunch of 'O' shaped birds." Within days of the chicken encounter, White Castle restaurants introduced new, intensely flavored chicken rings, available in Tabasco and Hidden Valley Ranch flavors for a limited time only. A White Castle representative denied any knowledge of such chicken farms and would not reveal the source or process of making the rings.